The best sight in the world is a Col sign. 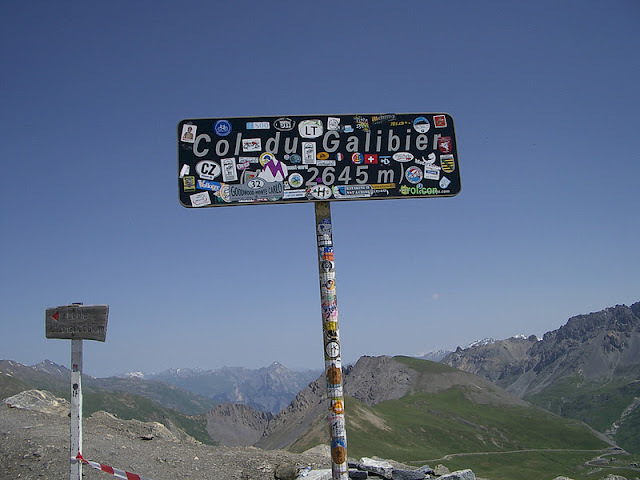 A Col sign means I have arrived and not only have I arrived but I have arrived at the top. Any cyclist that has, through their own effort, reached a Col sign in Europe and happily stopped under the sign, can in a moment recall the memory of joy and the corresponding alleviation of pain. I am not sure which is better. It doesn't matter if I constantly struggle to remember the letters on the sign which follow the first word Col - Col du, Col de, Col de la, Col des, Col d', all I see is that glorious word Col. 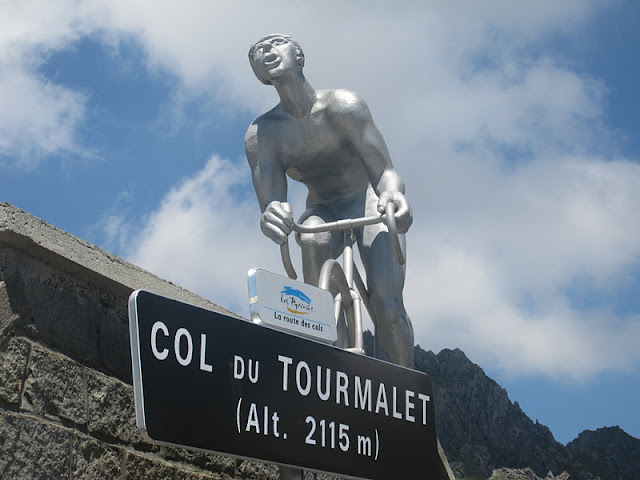 Although I do proudly remember in great detail which mountain the word Col labeled - Galibier, Tourmalet, Aubisque, Glandon. Anything that follows the word Col guarantees the experience of suffering, exhilaration, determination, and gratification. A common tradition among cyclists, upon arrival at a Col, is to immediately pull out the camera. We gather around the sign as proud as the first ascendants, and seem invisibly tethered to it, not wanting to depart it's attraction. Pull out any photo you might have at the top of a mountain pass and I guarantee the image will bring a smile to your face; I remember being there. 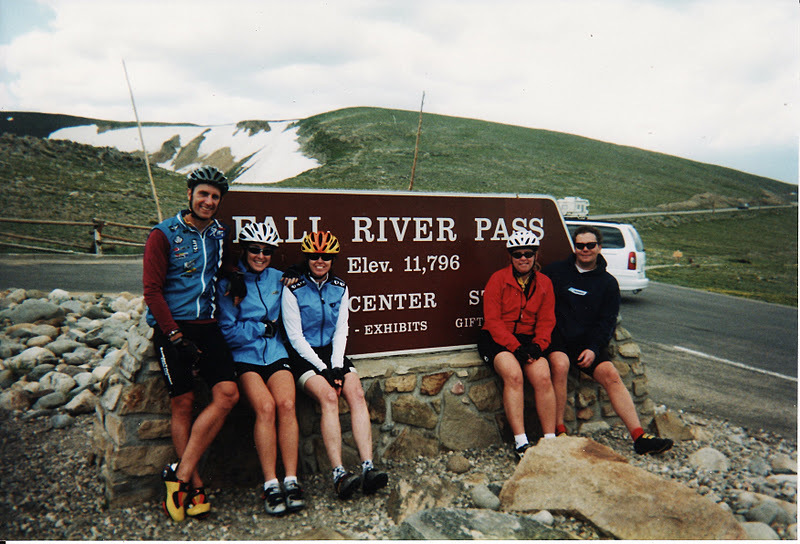 Two weeks after I bought my first road bike, this photo below was snapped with friends on my first ever ascent, which happened to be Trail Ridge Rd in Rocky Mountain National Park, Colorado, (that's me in the middle with my stylish helmet). Seeing this photo brings back memories of the incredible day spent with friends and the effort exerted to get to this sign. How many cyclists have gathered around this same sign? 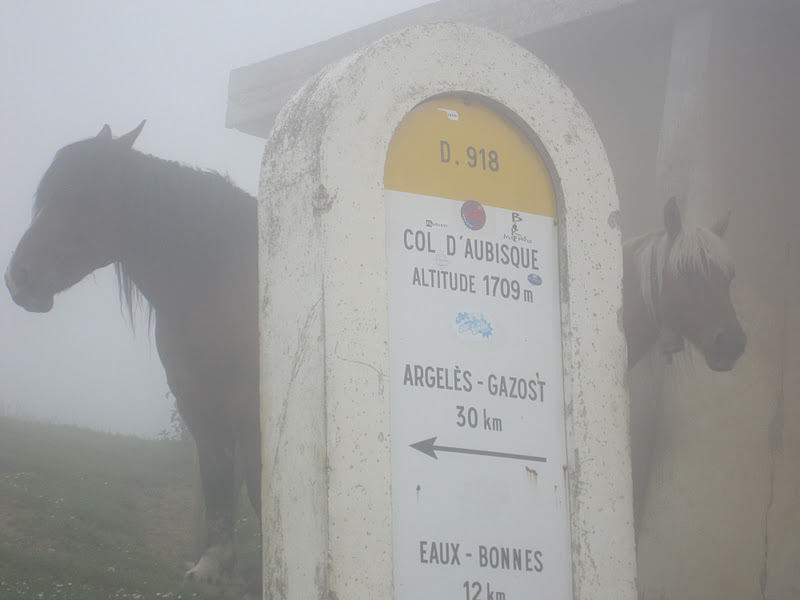 My favorite photo of a Col sign is this one taken during a climb to my favorite Col in the French Pyrenees - Col d'Aubisque/Col du Soulor. This past July I had a good laugh when Ted King posted this picture of his ascent from Aspen to Independence Pass with Timmy Duggan. 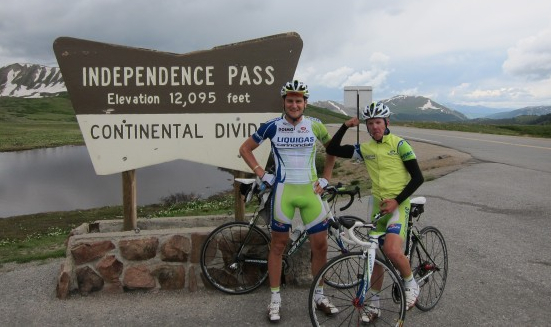 Both professionals rode with the Liquigas-Cannondale team. They snapped this photo during a training ride in Colorado. Pros and amateurs alike - we all love Col signs! Quotes of the Day: "Mountains have a way of dealing with overconfidence." ~ Hermann Buhl. "You cannot stay on the summit forever; you have to come down again. So why bother in the first place ? Just this: What is above knows what is below, but what is below does not know what is above. One climbs, one sees. One descends, one sees no longer, but one has seen. There is an art of conducting oneself in the lower regions by the memory of what one saw higher up. When one can no longer see, one can at least still know." ~ René Daumal.